If most people are being honest, they would admit their everyday lives aren’t all that exciting. Whether you’re working a 9-5 or making a living by some other means, there aren’t many extraordinary things we come into contact with during a given week. Which is why it makes total sense that we turn to various forms of entertainment to help us escape from our everyday lives and feel like we’re a part of something big, important, and exciting for a couple of hours. Few things have done a better job of helping us in our endeavor to vicariously pursue excitement than watching 300-pound men battle for 3-plus hours at a time during the months of September to February. The NFL provides this release and rush for millions of Americans every week, and most things in our culture simply can’t compete. But when it comes to the men who play this game, most people probably don’t think too deeply about who they are outside the lines because, not only could it potentially ruin the magic of the entire experience, but it really doesn’t matter in the context that we consume football. After all, does it really matter to a football fan if the star defensive end on his or her favorite team isn’t a great guy off the field as long as he can rush the quarterback? Like an amazing book that gets made into a mediocre movie, you’re usually disappointed if you happen to find out that a player on your favorite team turns out to be completely different off the field than what you might have imagined while watching him perform on the field. Looking through this lens, Sherman’s postgame comments reminded us that football players are more or less regular people when they step outside of those lines and take their pads off. Sure, most are bigger than anyone you know, stronger than anyone you know, and have more disposable income than anyone you know, but they’re still just people when you strip all of those things away. The idea that Sherman could make the biggest play of his life and maybe the biggest play in the history of the Seattle Seahawks, and then respond with a petty comment about Michael Crabtree interrupted OUR good time. We wanted to bask in the glory of two extremely talented football teams beating the snot out of each other for three hours and 35 minutes, all of which culminated in Sherman’s amazing display of athleticism that sent his team to the Super Bowl, before we returned to reality and realized we had to take out the garbage and start mentally preparing ourselves to go to work or school the next day. Someone who is as talented as Sherman should have either refused the interview because he had to rescue a group of kids from a burning school bus, or he should have said a few words about the 49ers being a great team, and how happy he was about the outcome of the game, and moved on; leaving us to sit in our happily glazed-over state that only 7 straight hours of football euphoria can produce. Instead, he sounded like the old man on your block who yells at passersby for throwing their garbage out in his trashcans, or those two strangers who got into an argument on the subway that made everyone’s commute uncomfortable for 10 minutes. Those interactions are petty and generally miserable, and many people were outraged by what Sherman did because it was so decidedly average and something that ‘regular people’ do all the time. The dichotomy of Sherman reaching the pinnacle of athletic greatness and then immediately following it up with what some perceived as a bitter, angry, boastful, and somewhat bizarre tirade about a player on the other team didn’t compute. People who are capable of doing great things like Richard Sherman shouldn’t be petty, they shouldn’t hold grudges, and they should wait for us to anoint them the best, not boast about how good they are, no matter how true it might be. They should be above all that. When people got wind that Sherman wasn’t, the hate flowed. Without a doubt there’s a racial side to this entire story as well. It’s tough to say for sure how people would have reacted to a white player making comments like Sherman did, but I sincerely doubt that things would be taken where some people took them on Sunday night. 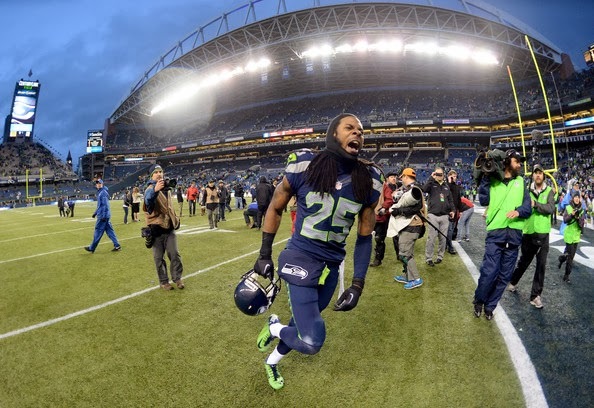 Sherman’s actions weren’t what most people wanted or expected to see, and he indirectly reminded us just how ugly and ordinary the world can be, which is the exact opposite of why we watch TV, and sports to a lesser degree. 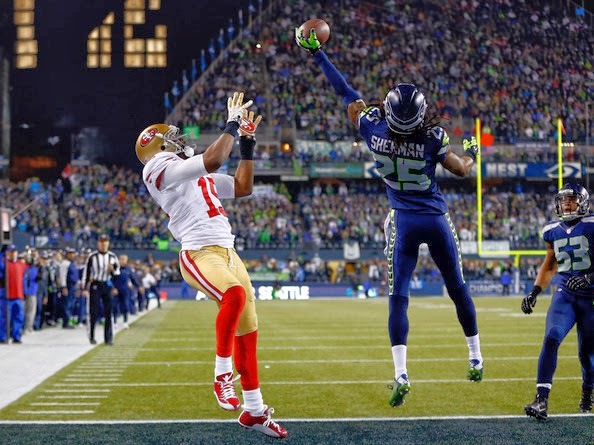 We want to like Richard Sherman (or at least enjoy watching him play football) because he’s damn good at his job. We want to like him because what he does is so important to a mind numbing amount of people. We want to like him because he just made one of the best plays in one of the biggest games of the 2013 NFL season, and his mere presence on that field is the kind of story they make feel-good movies about. His postgame interview isn’t what the majority of America wanted, and the reaction to Sherman’s comments were far worse than Sherman’s reaction when Erin Andrews put that microphone in front of his face. Whether he had to or not, Sherman has since apologized for his comments but it’s too bad that some people reacted so negatively to the realization that what they watch on television and what they experience in their everyday lives might not be as far apart as they once thought.